How are ecological designers addressing the many challenges communities face and incorporating climate change resilience into their work? Robbin Peach ’78, founding resiliency program manager at Massachusetts Port Authority, illustrates the importance of asking the right questions and bringing key players together to understand the implications of climate change. Bird Fellow Gioia Kuss ’99 describes the fragile tropical ecology of Costa Rica, and documents the landscape with stunning photographs, and scholar and artist Dr. Claudia J. Ford demonstrates the power of stories to address complex and intractable problems. As always, you will also find highlights from recent student projects, the latest school news, and our annual report. We hope you enjoy this issue! Please use the form below to be added to the mailing list for the 2018 issue of con’text. 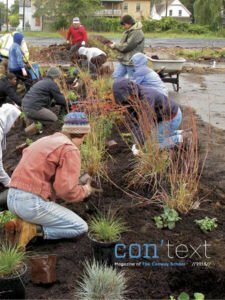 The 2016 issue of con’text discussed the relationship between people and place in design and planning. What do you think of con’text? Are there topics or authors you would like to see published? Let us know.